Lane Murdock, a high school sophomore, says she felt numb after the school shooting in Parkland, Fla., and knew it was time for her to try to make some change. 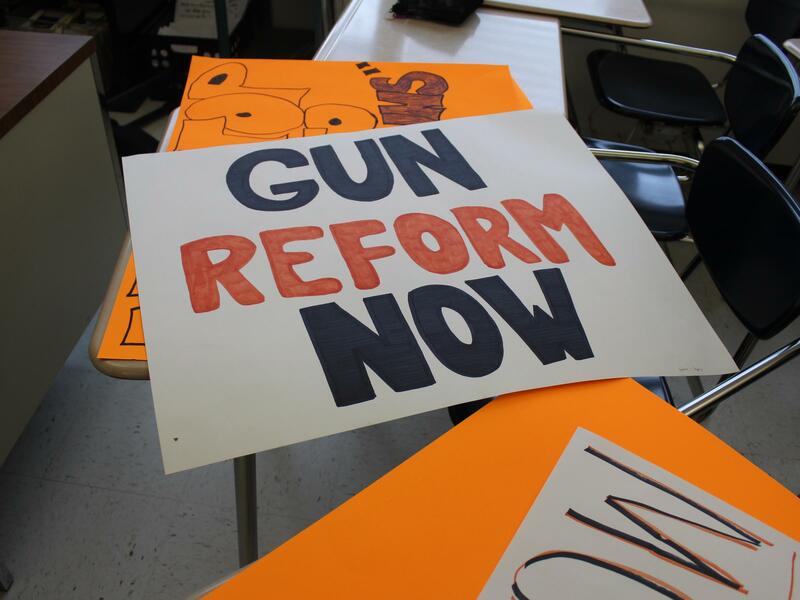 Student organizers at Ridgefield High School in Connecticut made posters to use at the nationwide school walkout on Friday to protest gun violence in schools. Lane Murdock (left) and Paul Kim are two of the student organizers for Friday's walkout. 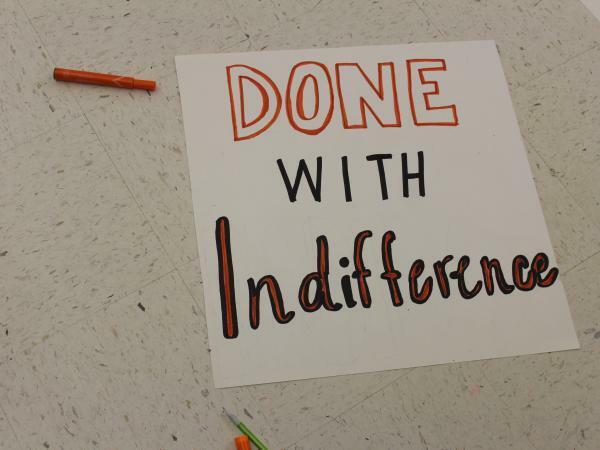 One poster made by students at Ridgefield High School in Connecticut for the school walkout. So that same day, Feb.14, Murdock started a Change.org petition that so far has received more than a quarter-million signatures. Her ask? A walkout to protest violence in schools that she planned to coincide with the anniversary of the mass shooting at Columbine High School in 1999. Murdock was born in 2002. On one of the last days of spring break, she and seven other students from her high school in Ridgefield, Conn., gather around a few tables at their town rec center. They have been working hard, even losing sleep, trying to get organized for the day. As Murdock says, "Success knows no sleep." This is, by far, the biggest event they have ever planned. She and her team have more than 2,500 walkouts across the country registered through their website. They've drafted a long to-do list, including everything from securing a stage for speeches for their local walkout, to reaching out to the national press. "Prioritize," Murdock tells her team, "We're not going to be able to get 100 percent of these things, I can guarantee that, but it's important that we get the important things." Murdock wants the walkout to go down in history but acknowledges that it won't represent every student's perspective. Some polls show that young people are no more liberal than older generations on gun control. And other students who live with gun violence regularly have said they don't feel represented in the social movements following the shooting at Parkland. "There's gun violence that's been happening every day that isn't a school shooting," Murdock says. She wants the day to be inclusive. On the other hand, she knows it will be uncomfortable. "We get hate comments online all the time because we're angering people, and we're angering people because we're scaring them, and if we're scaring them it's because we're doing something," she says. She wants people to know that she's imagining this day to be very different than the March For Our Lives or the 17 minutes of silence on March 14 in honor of the victims in Parkland, Fla. This walkout will last from 10 a.m. through the end of the day. "People ask me, like, 'Why? Why all day?' " Murdock says. That's because "this is a topic that deserves more than 17 minutes." Part of the plan for the day is to get students together in what they refer to as "a call to action," registering voters or writing to elected representatives about the need for further gun control, for example. These student organizers have gotten help from a national nonprofit called Indivisible, a group that says it aims to "fuel" young people to "resist the Trump agenda." 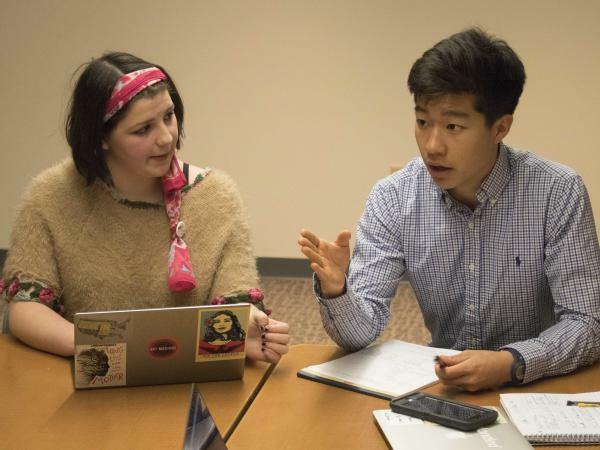 Paul Kim, a senior at Ridgefield in charge of communications for the event, says Indivisible helped the high school organizers map their outreach online. "I got every chapter signed up in Texas," Kim says, talking about all the walkouts they've registered. "And these people emailed back ... I could like feel the Texas in the email. The accent, everything." The group laughs. To Murdock, the widespread support she says they've seen shows that sensible gun control doesn't have to be partisan. "It is not conservative or liberal. 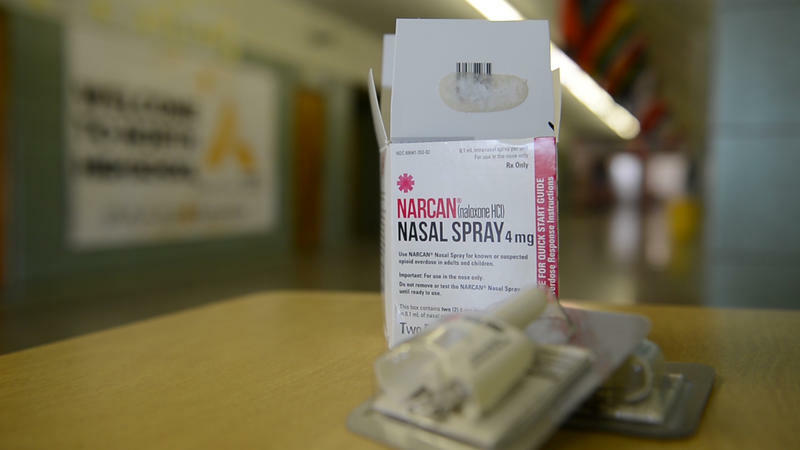 It is just about making sure our children don't get harmed in school and we don't live in a community and in a country that has institutionalized fear," Murdock says. "I think we're all sick of it. That's why we're doing this." She grew up with that fear. Her school had regular lockdown drills after 26 students and educators were killed in a shooting at Sandy Hook Elementary School when she was in fifth grade. It happened just 20 miles from her classroom. She says there is a reason why she felt desensitized when she heard about Parkland. She and her team of fellow organizers at Ridgefield say that gun violence in the U.S. has gone on for too long. "Change happens through patience and this fight does not stop after April 20," Murdock says. "There is going to be a lot of work to be done after April 20 and that is going to include you guys and it's going to include tons of students all across this nation," she says talking to the group. At 10 a.m. local time on Friday, thousands of students will march out of their classes wearing orange for gun safety and chanting for change. This next story highlights the power of a single citizen. She's a 16-year-old in Connecticut who responded to the school shooting in Parkland, Fla. The same day, she started a petition on change.org, which now has more than a quarter-million signatures. She called for a national school walkout, which has now grown from an idea to an actual event tomorrow with thousands of people participating. Cassandra Basler of member station WSHU has the story of the student who started it. CASSANDRA BASLER, BYLINE: That student's name is Lane Murdock. 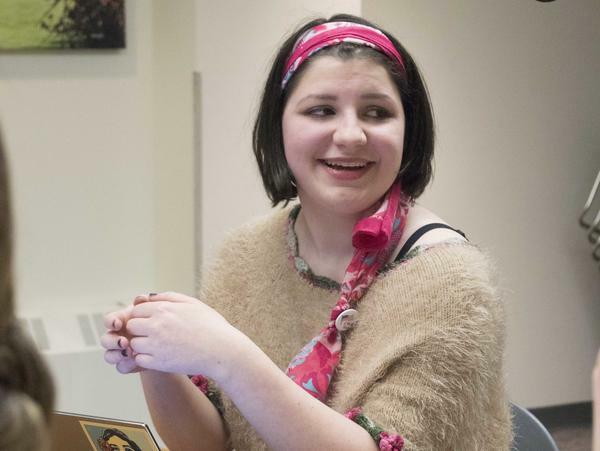 And on one of the last days of spring break, she and seven others from Ridgefield High School in Connecticut get together around a few tables at their town rec center. UNIDENTIFIED PERSON #1: Yeah. Can I see the to-do list? BASLER: They've been working hard and even sometimes losing sleep, trying to get organized. Murdock jokes about how a friend caught her working on plans for the National School Walkout at an ungodly hour. BASLER: Success knows no sleep. Murdock reminds her team that they are days away from the biggest event they have ever planned - more than 2,000 walkouts across the country. MURDOCK: That's why, again, like, prioritize because we're not going to be able to get a hundred percent of these things. I can guarantee that. But it's important that we get the important things. BASLER: Murdock wants the National School Walkout to go down in history but acknowledges that it won't represent every student's perspective. Some polls show that young people are no more liberal than older generations on gun control. And other students who live with gun violence daily have said they don't feel represented in the social movements following the shooting at Parkland. Murdock wants it to be an inclusive day and knows it'll be uncomfortable. MURDOCK: You know, like, we get hate comments online all the time because we're angering people, and we're angering people because we're scaring them. And if we're scaring them, it's because we're doing something. BASLER: She wants people to know that this walkout is not like the March for Our Lives. It's not like the 17 minutes of silence on March 14 in honor of the victims in Florida. This National School Walkout will include something the organizers refer to as a call to action, and it'll last nearly all day. MURDOCK: And a lot of people ask me like, why - why all day? Like, why? UNIDENTIFIED PERSON #2: Why? Why? MURDOCK: And, like - and it because it's, like, this is a topic that deserves more than 17 minutes. BASLER: Paul Kim is the senior in charge of communications for the event. He's also mobilizing students at the protest. PAUL KIM: There are a lot of people really excited about registering people to vote. And the League of Women Voters - I think that we should go with them because they're on campus all the time. BASLER: These student organizers have gotten help from a national nonprofit called Indivisible, a group that aims to get young people involved with government and challenge President Trump's agenda. Kim says the group helped them map their outreach online. He tells his classmates how proud he is of all the walkouts they've registered across the country. KIM: I got every chapter signed up in Texas. And, like, these people email back - I could, like, feel the Texas in their email. KIM: ...The accent, like, everything. BASLER: To Lane Murdock, the widespread support they've seen for the walkouts shows that sensible gun control doesn't have to be partisan. MURDOCK: No, I don't care who your party is, and I don't care who you naturally will, like, vote for as long as you're voting for common-sense gun control. It is just about making sure that our children don't get harmed in school, and we don't live in a community and a country that has institutionalized fear - because we are in a country that has institutionalized fear. MURDOCK: And well, I think we're all sick of it. That's why we're doing this. BASLER: She grew up with that fear. 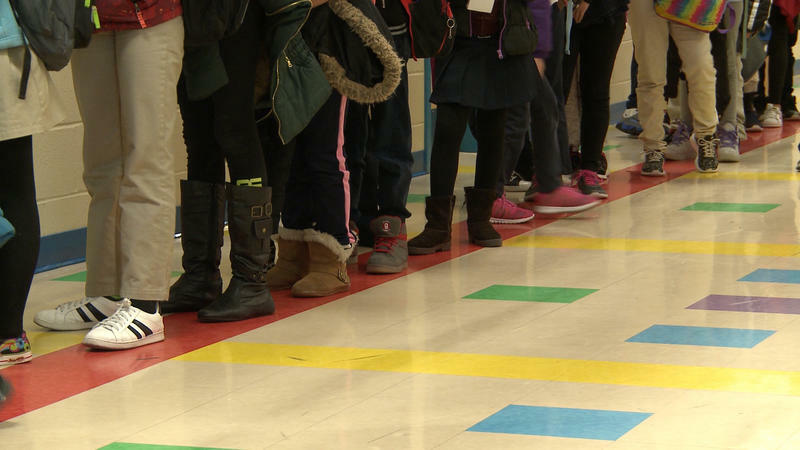 Her school held regular lockdown drills, and she was in fifth grade when 26 students and educators were killed in a shooting at Sandy Hook Elementary School. It happened just 20 miles from her classroom. She says there's a reason why she felt desensitized when she heard about Parkland. She tells the group, and they agree, gun violence has gone on for too long. MURDOCK: Change happens through patience. And this fight does not stop after April 20. BASLER: Murdock says there's still a lot of work to do, and that starts tomorrow at 10 a.m. local time, when thousands of students will march out of their classes wearing orange for gun safety and chanting for change. For NPR News, I'm Cassandra Basler in Connecticut. Transcript provided by NPR, Copyright NPR.